I Fought Six Pocket Picking Gangsters in Guangzhou! Recently I visited Guangzhou China. On November 24, 2008, around 4 PM, by the bus station of Zhongshan 8th Road . I unexpectedly wound up in a savage fight to protect myself from a gang of violent pickpockets! In this area there is a local outdoor market with lots of stalls selling fresh fruits, produce, clothing, shoes, food and so on. I was browsing in the market, when a guy walked next to me and bumped into my left side. At the same time, another man was trying to pick my pocket on my right. I felt my pocket moving and realized I was being robbed! I turned around and threw a back fist into the face of the thief ending the robbery. But much to my surprise another crook immediately moved in to help his friend. He approached from the front on my right side and tried to attack me. I used the same hand, my right, to hit this new attacker with a swinging fist to the back of his head. Yet another criminal on my left side rushed over and tried to attack me! In the blink of an eye I found myself in a serious fight with multiple street toughs! I used a side kick thrust to the new attacker's hip. At the same time, I used the whipping fist to hit one of the other thieves who had moved back in to attack. As I was hitting my assailants, I was able to maneuver to one of the selling stalls to cover my back and prevent an attack from behind. In that split second, another angry thug rushed in. Without thinking I connected with a potent palm thrust to his nose. Two more attackers appeared out of nowhere and I met each with a rapid right fist to the face. Incredibly, I used my right hand to hit five attackers and kicked one of the others. I had instinctively prevailed in a unexpected fight against 6 street thugs! The crowd around me broke into spontaneous applause and cheering. One of the criminals was on the ground knocked out. Looking around I could see these guys were bleeding and in pain. They were hurting pretty badly and were understandably afraid of me. They wisely decided not to attack me anymore. However, I was still outnumbered 6 to one and I wanted to avoid Chinese Police complications, so I decided to retreat while I was ahead. The knuckles of my right hand were hurting quite a bit at that point but otherwise I wasn't injured. That next day my right arm was sore and tired. The entire fight with those 6 thugs, not including the pick pocket, was over in less than 10 seconds! After the fighting stopped, I thought through what had just happened. I realized that I only used my right hand for all the strikes. The first strike was a kwa-chui that hit the guy who tried to pick my pocket. I used the kup-chui to hit the first thug who rushed in to try and help the robber. Then I followed up with a left tsang-geuk kick to the 2nd attacker and I lashed out with a dot-chui to the 3rd crook's neck. I used a gong-jeung thrust to the 4th hoodlum's nose and then used a tsop-chui to the 5th goon's face. With the same fist, I used another tsop to the 6th tough guy's eye. Everything rushed by in just a few seconds. Before I left the scene I surveyed the damage. One thief was knocked out cold on the ground. Some members of the gang tried to help him to wake up. I believe he was the thug I used the kup-chui on. Another one of the gang got up slowly from the ground obviously in pain. I had sent a couple of these bullies flying giving them bloody noses. Two other crooks ended up with blood on their mouths and chins. When I left the scene of the attack I was afraid that I might have seriously injured or killed the thug on the ground. I felt really bad about this, I do not like to hurt people. Happily, a couple days later, one of my students went back to the market area and asked a vendor who witnessed the fight what had happened to the knocked out gangster. A lady told him that the attacker on the ground was okay. He woke up and his gang helped him walk away. After this news, I felt much better. Hopefully, these crooks will think twice before preying on innocent victims in the future. I recounted the details of the fight to some of my students for learning and training experience. One student asked me why I only used my right hand. I landed blows with just my right because I am a right handed person, therefore my natural reaction was to use my right hand. I used my left hand as the guarding hand. A tai chi student asked me why I didn't use any of the tai chi fighting techniques. My answer was; I used the tai chi principles of fighting. 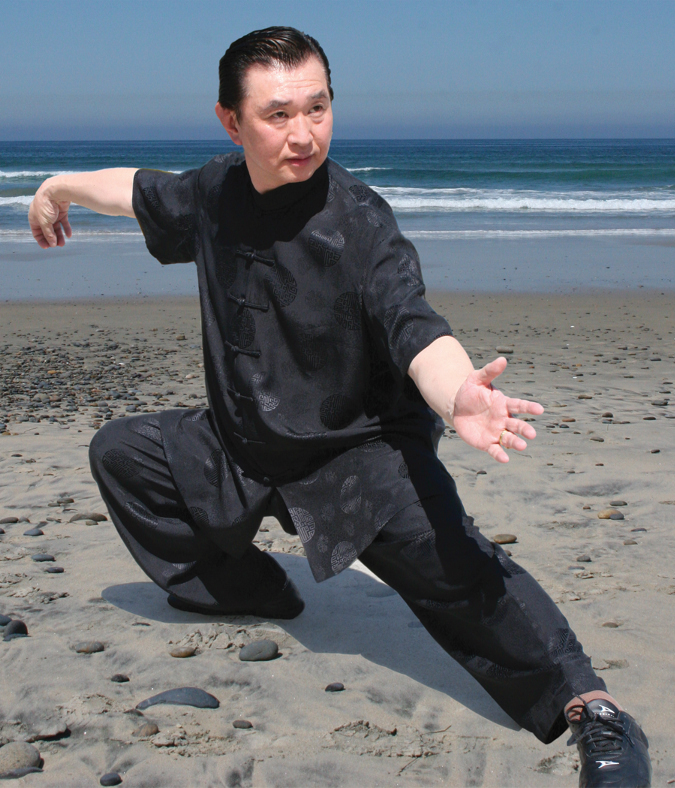 In the tai chi classics, there is a saying: "When he is not moving, I don't move; when he moves, I get in first". The fact that I was able to walk away from this fight with only minor injuries was from my tai chi push hands timing and drilling training. I was able to respond instantly because of my years of reflex training from choy li fut. Another student asked me why I didn't just block the attackers' coming strikes; why had I decided to hit them? Here is how I answered the question: the saying in choy li fut is: "blocking without striking is a low level of fighting, blocking with striking is the intermediate level of fighting, striking without blocking is the high level of fighting". I don't think I am in that high level at all, but I applied the last principle to that situation at that time. It is important to remember that I struck the attackers only because they attacked me first. I have always said that the best fight is the one you never have. However, I train my students to know that when one must fight, then fight to win. This was one of those rare situations where there were no opportunities to withdraw peacefully. I had to fight, so I fought with everything I had. When I realized I was safe, I stopped and did not inflict unnecessary injury to my attackers. My job was to protect myself, the punishment of these criminals is the duty of higher forces in the Universe.